Everyone has heard of the Transcontinental Railway, but have you heard of the Transcontinental Airway? You haven’t? Shame on you. Well, not to worry, in my role as part-time amateur aviation historian, I’m here to help. In an era before radio navigation, the United States government created a series of air routes marked by a chain of lighted beacon towers. It was a massive, amazing, expensive undertaking. They built 53-foot-high towers every 10 to 15 miles, from coast-to-coast! Pilots flying the night mail used the system to find their way safely over the darkened landscape by flying from point of flashing light to point of flashing light. Can you imagine what that must have been like, alone in the dark in an open-cockpit biplane, bone-chilling wind whistling through the wires that held wings of cloth and wood together, following a flashing chain of pearls below? The beacon towers sat on massive brightly-painted concrete arrows that literally pointed the way by day. Built between 1923 and 1933, the final network of towers and arrows was made up of more than 1,500 sites lighting 18,000 miles of airmail routes. 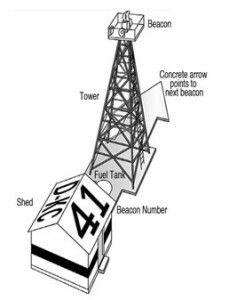 At the start of World War II, fears of Japanese air raids, combined with the advent of radio navigation, led to the shuttering of the beacon system. Then the need for raw materials for the war effort led to most of the towers being dismantled for their steel. Over the following years, time and the elements set in, and today the location of most of the sites is a mystery. I’m still planning to do that story, but in doing my initial research for it, I discovered that one of the early airmail routes, the Los Angeles-Amarillo Airway, actually passed a few miles south of my house. 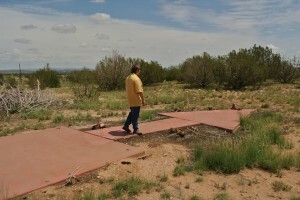 At one time there were a dozen beacons and even an intermediate airfield nearby. Holy cow! I wish that airfield were still there, it would mean a 10-minute commute to the family Ercoupe, not a 45-minute one! Anyway, nobody around here knew anything about the field, so I decided to search for the site myself. I used antique aeronautical charts I purchased on eBay, satellite images on Google Earth, modern GPS, and aerial search techniques that I learned twenty-five years ago in the Civil Air Patrol. For weeks we burned holes in the sky to no avail. To be honest, we weren’t even sure what we were looking for. Might we be so remote that the towers are still standing? If not the tower, maybe the support shed? And, hey, just what kind of altitude do you need to be at to see one of these arrows, if there was even one to be seen in the first place? But we struck out time and time again, and I began to believe that the sites were buried under decades of blowing sand, grass, and juniper trees and might never be found. Not, at least, by the likes of us. But today, criss-crossing empty fields and mesa tops at 100 feet above the ground, canopy open and wind in our hair, Rio and I spotted one of the 30-foot-long stone arrows from the air. After much whooping, high-fiving, fist-pumping, and generalized happy chaos in the cockpit, we flew IFR–I Follow Roads–to figure out how to get “boots on the ground” at the site. After we landed, hangared Tess, and did all our post-flight stuff, we hit the truckstop for critical supplies (Doritos, water, and beef jerky) and went four-wheeling. 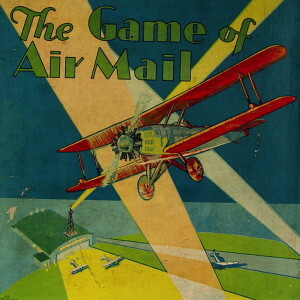 Flying the Air Mail, now those were the days of High Adventure! But this… this wasn’t too shabby either! I’m on assignment for Smithsonian Air and Space. 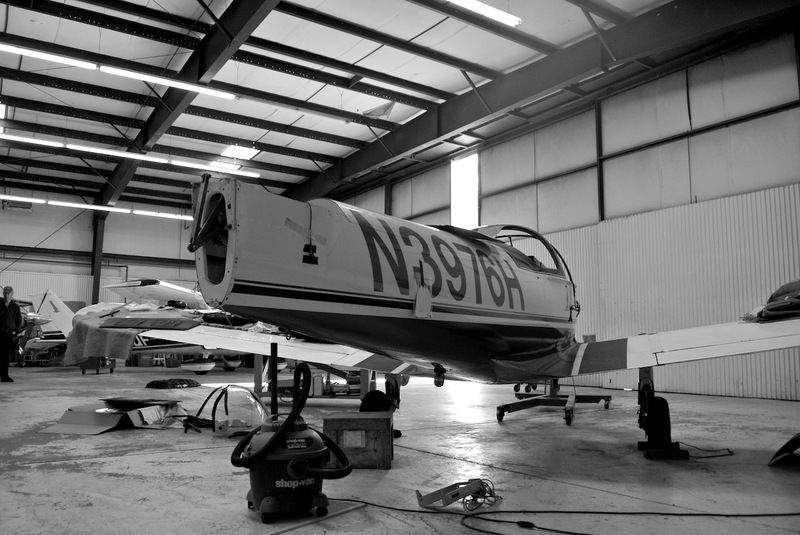 My story: Write up my year-long epic in buying and restoring N3976H, our 1947 Ercoupe 415 CD. The only problem? I need to do it in 1,200 words. That’s only 3.2 words per day! As you can’t even do haiku in that length, my editor has cautioned me that I might need to edit out part of the tale to keep it short enough. But I need to get started. So where to start this story? Good stories don’t always start at the beginning. Sometimes they start at the end. Sometimes they start in the middle. Mine has so many twisting paths that it’s really at least five stories in one. The entire tail of the airplane, with its distinctive twin rudders, was nowhere to be seen. The engine was exposed. The propeller lay on the floor of the hangar. A small crane suspended the front of the plane because the nose gear had been taken off. All the windows were missing and the panel looked like Swiss cheese— empty gaping holes where instruments should have been—wires running hither-thither. It looked more junkyard than restoration, and I don’t think I’ve ever been more depressed in my life. You know, you need to be careful what you wish for. It started with a bent wheel. Some moron taxied my favorite rental plane off the edge of the runway and bent one of the wheels of the main landing gear. No big deal, but the replacement wheel had to be ordered from Germany, and the plane was out of service for a couple of weeks. And I began to go through flying withdrawal. That, in turn, led to the conversation that would change the course of my life. Well, at least the course of my life for the next twelve months. And the course of my checking account forever. I was hijacked. But I couldn’t enter the air piracy code—7500—into my transponder. Like many things in my “brand new” plane, the transponder wasn’t working. But it wouldn’t have helped anyway. After all, the hijacking took place in my kitchen. And the hijacker was my 87-year-old mother. It was going to be a bad landing. We were too damn high, too damn fast, and it was too damn late to do anything about it. My engine was overheating and the gas tanks were leaking. I wasn’t sure I had enough gas left to abort the landing and do a go-around. And to top it all off, with no functioning radio, I couldn’t tell the other planes in the traffic pattern what I was doing. “Come on, come on, come on,” I urged little plane towards the runway, as if words alone could change the laws of aerodynamics and gravity. 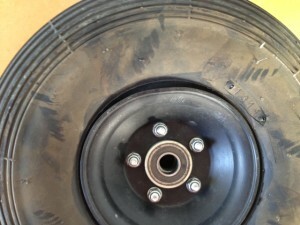 My wheels hadn’t kissed the pavement yet and I was running out of runway. We were safe and sound on the ground. Safe and sound on the ground, with bone-dry tanks, at a remote strip where they didn’t sell gasoline. South of the forlorn airstrip the mountains of Mexico shimmered in the late-day heat. Nothing stirred. A faded windsock hung limply from its mast. Next to the crumbling terminal building sat a single pathetic Saguaro cactus. Across a seemingly endless expanse of sweltering concrete sat four airplanes under a two-story-tall sun shelter that wasn’t working—its massive roof cast the cooling shadow far beyond the tied-down airplanes, and all of them sat baking in the sun. One of the planes was a little blue and white Ercoupe, and boy, was I happy to see it sitting there. I’d had nightmares for a week that I’d be standing on this very spot staring at empty pavement. 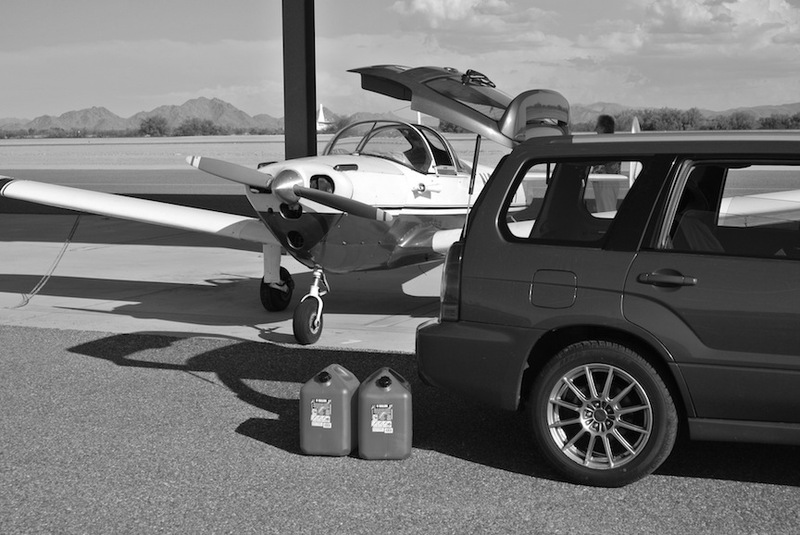 A week ago, when I had to abandon my “new” plane—out of gas and with broken radios—at this remote spot, I learned that just days before someone else’s plane had been stolen from the very spot I was parked in. 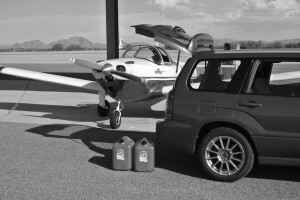 I had come back to Gila Bend, Arizona, in a Subaru full of Jerry Cans to rescue my “new” airplane. So which lead did I choose in the end? Well, you’ll just have to wait until the magazine comes out. In the meantime, welcome to Plane Tales, my new home base. The virtual airport for my pen. Here I’ll keep you up-to-date on my Fly Writing with links to new articles as they are published, expanded content, exclusive stories, and assorted adventures that take place on a Wing and a Pen!